The bobcat is a North American cat containing 2 recognized subspecies, it ranges from southern Canada to central Mexico, including most of the contiguous United States. The bobcat is an adaptable predator that inhabits wooded areas, as well as semidesert, urban edge, forest edge, and swampland environments. It remains in some of its original range, but populations are vulnerable to local extinction (“extirpation”) by coyotes and domestic animals. With a gray to brown coat,whiskered face, and black-tufted ears, the bobcat resembles the other species of themidsized genus Lynx. It is smaller on average than the Canada lynx, with which it shares parts of its range, but is about twice as large as the domestic cat. It has distinctive black bars on its forelegs and a black-tipped, stubby (or “bobbed”) tail,from which it derives its name. methods to mark its territorial boundaries, including claw marks and deposits of urine or feces. 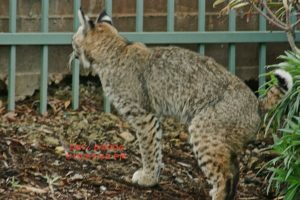 The bobcat breeds from winter into spring and has a gestation period of about two months. 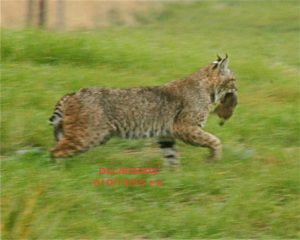 Although bobcats have been hunted extensively by humans, both for sport and fur,their population has proven resilient though declining in some areas. Here is a very nice photo taken at Sunol Region al Park by an unknown photographer. 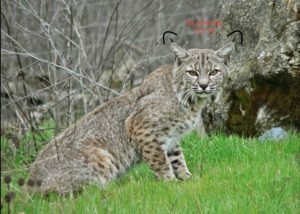 The ear tufts are not easy to see so I highlighted them. Following are two photos I took and I apologize for their poor quality. 2004 is the year I got into photography buying my first digital camera. I lived in a development at the east end of Scott Creek Road in south Fremont. Scott Creek and dry grass hills above the development plus all the green common area provides lots of opportunities for wild life. turned and her two kittens were there waiting for the meal. They disappeared into the brush. 38 minutes later I walked into my back yard and got the photo of the big male marking his territory on my bushes and BBQ. He is most likely the father of the kittens I saw just minutes earlier. Pretty neat!